The protein is produced by expression from bacteria which are grown on minimal medium supplemented with 15NH4Cl and either 1,3-13C-labelled glycerol or 2-13C-labelled glycerol. The labelling scheme obtained is somewhat involved. In the following figure the sites coloured in blue are labelled in the 1,3-13C glycerol sample and the sites coloured in red are labelled in the 2-13C glycerol sample. For those amino acids synthesised via the citric acid cycle several so-called isotopomers are obtained which then result in the average labelling shown above. For threonine the individual isotopomers which give rise to the average labelling are shown. 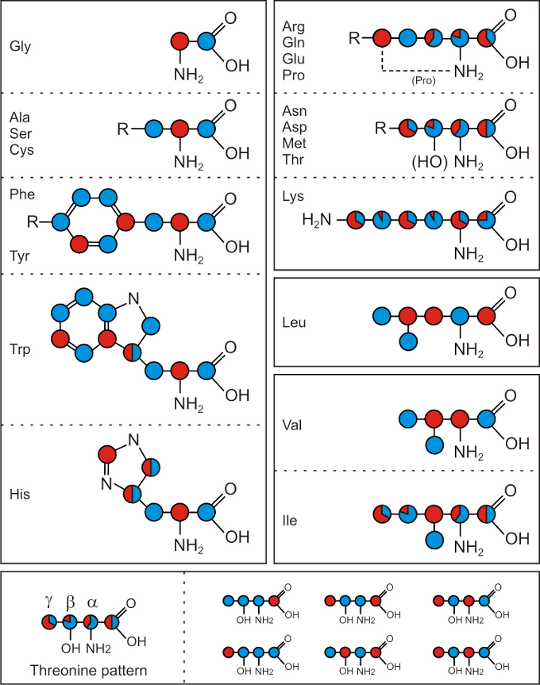 A complete figure of all the isotopomers is available here. Note that the relative populations of isotopomers shown in these figures are those determined for SH3 (Castellani et al. 2002) – for other proteins they may be slightly different. Originally labelling with 2-13C-glycerol was used to for relaxation measurements in solution (LeMaster and Kushlan, 1996). The Cα atoms in such samples do not contain any neighbouring 13C-labelled atoms (with the exception only of Valine). Relaxation measurements on the isolated 13Cα-1Hα groups can therefore be interepreted more easily without having to take couplings to the neighbouring carbon atoms into account. More recently Castellani et al. (2002) showed that 1,3-13C- and 2-13C-glycerol labelled samples are useful for protein structure determination in solid-state MAS NMR. The samples have several advantages: (a) many J-couplings are removed which results in sharper lines, (b) very strong dipolar couplings between neighbouring atoms are removed and enable more long-range correlations via weak dipolar couplings to be observerd and (c) the spectral overlap is decreased. Currently this is probably the most common application of 1,3-13C- and 2-13C-glycerol labelling. The characteristic labelling patterns for each amino acid can also be exploited for assignment purposes (Higman et al. 2009). Hong and Jakes (1999) combined 2-13C-glycerol labelling with amino acid specific labelling in order to label only half the amino acids with 2-13C-glycerol. See here for a varient in which 1- and 2-13C-glucose is used rather than 1,3- and 2-13C-glycerol.